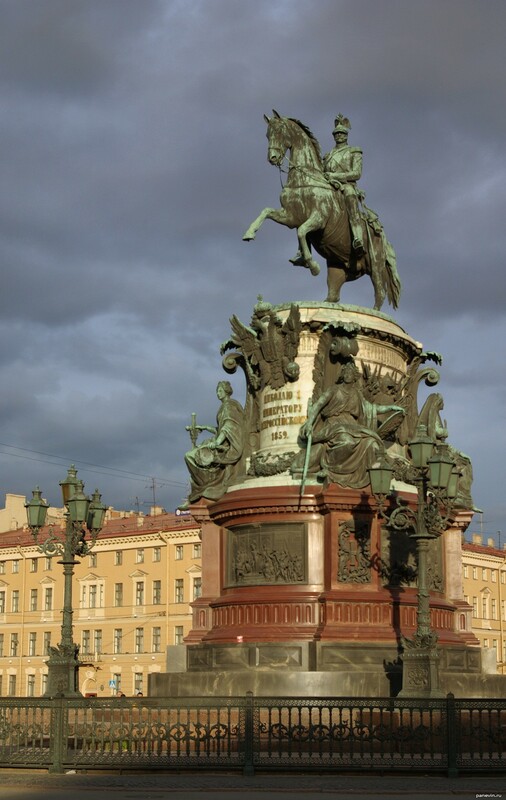 Monument to the Russian emperor Nikolay I on Isaakievsky square St.-Petersburg. Is the unique equestrian statue having only 2 points of support. It is harmoniously entered in the most beautiful ensemble of the square and settles down between the Mariinsky palace and Isaakievsky cathedral. Blog, posts attractions, best, Isaakievsky square, monuments, St.-Petersburg. monument to Nikolay I Monument to Nikolay I is turned to Mariinsky palace and displaced to it concerning the centre Isaakievsky square. Four bas-reliefs represent events of time of reign of the emperor­. A pedestal from different grades of a granite, porphyry and marble ... →.